The communis opinio is that as the imperial period (1.-6. cent. CE) progressed, the death penalty became an increasingly present threat and reality that was extended to ever smaller offences. 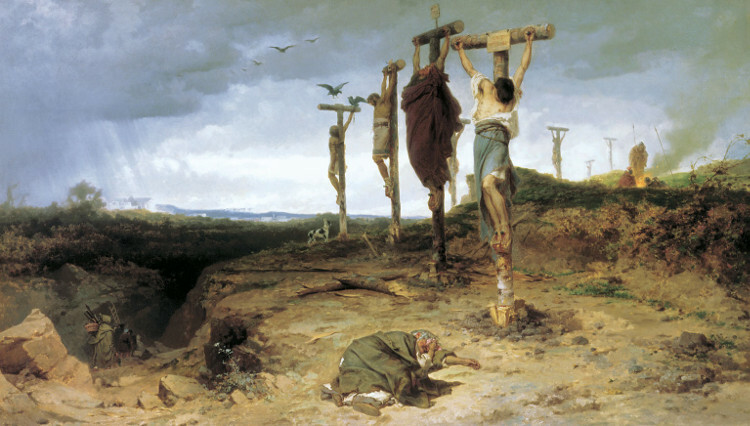 In this view, the number of executions increased, especially in Late Antiquity (4.-6. cent. CE). Furthermore, the simple form of execution, i.e. decapitation, was allegedly increasingly supplanted by extremer forms: The condemned were thrown to wild beasts, crucified, or burned alive. But is any of this true? So far, no scholar has been willing to face the toil of comprehensively reviewing the extensive and varied source material. This monograph project aims to do just that and to take into account not only legal documents but also the hitherto lamentably neglected literary sources (including the ample Christian literature of Late Antiquity). Doing so will allow for a revision of these older views, which were based on a very limited selection of material. Fyodor Andreyevich Bronnikov. The damned field. Oil on canvas 1878.